On Sunday I spent the day skiing in the backcountry. On Monday I hiked up Baker Mountain looking for wildflowers. Although I had two good ski days last weekend, my season is at an end. 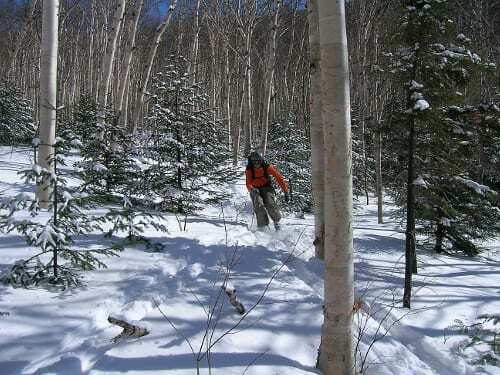 I skied the Whiteface Memorial Highway on Saturday and several trails in the High Peaks on Sunday. I found plenty of snow at higher elevations, and die-hard skiers know that it’s likely to remain for a while. I’d probably get out a few more times myself if my schedule allowed it. Overall, it was a pretty good winter. We had two snowstorms that created superb backcountry conditions. Alas, I was sick both times, and by the time I got better, the fluffy powder had turned to mashed potatoes. Nevertheless, I managed to ski 65 times, not a personal record but many more than the lousy winter we had last year. Most of my trips were short lunch-hour skis. On Saturday afternoon, I sent up the Whiteface highway as far as the Lake Placid turn, three and a half miles from the tollhouse. Conditions were excellent, except for thin cover in a few windblown sections a mile or so from the start. Chances are these sections have melted down to the pavement by now, but most of road should still be skiable. Surprisingly, I saw no other skiers, just a couple of hikers with a dog. On Sunday, I set out from Adirondak Loj for Mount Marcy on the Van Hoevenberg Trail. About four miles in, the screws on my binding pulled out. Fortunately, I had a repair kit and was able to retighten them. However, I thought better of continuing to Marcy. I turned around above Indian Falls and skied the Avalanche Pass Ski Trail instead. 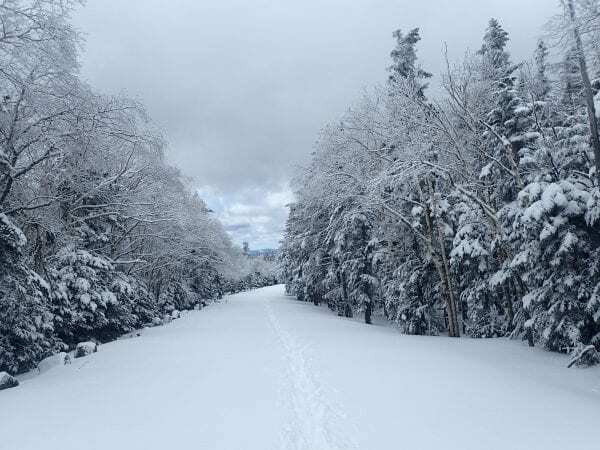 I got far enough up the Van Hoevenberg Trail to see that conditions had deteriorated considerably from a week earlier, when I did make it to Marcy. The snow bridge over Phelps Brook had collapsed, so I rock-hopped across. Above the crossing, I encountered more exposed rocks and rivulets on the trail along the brook than on my previous trip. And there was an open brook and several large craters on the ski trail below Indian Falls. 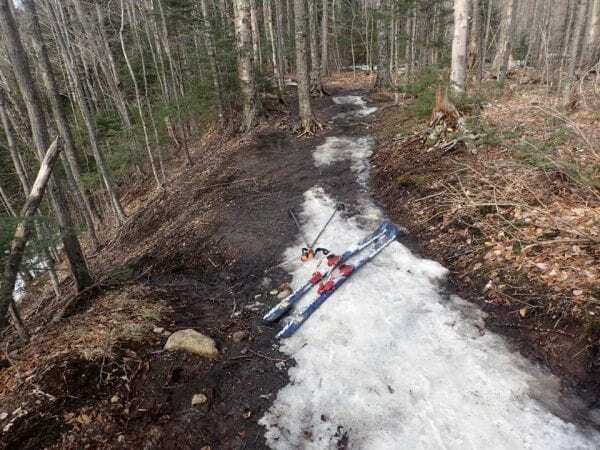 On my return to the trailhead, after a day of warm sun, it was no longer possible to ski all the way from Marcy Dam to the Loj. For now, there is still good snow at the higher elevations. Just be prepared to hike to find it. Incidentally, I didn’t see any wildflowers on Baker. Give them a few more days. My ski season ended about three-quarters of a mile from Adirondak Loj.